Ford's new six-speed PowerShift automatic transmission delivers the performance and fuel economy of a manual gearbox with the comfort and convenience of an auto. The secret behind PowerShift's smooth and frugal performance is the use of two electronically-controlled clutch units, which ensure seamless delivery of power to the wheels. The two clutches each control what are effectively separate three-speed gearboxes. When the driver selects "D", first gear is selected in gearbox one and second gear is pre-selected in gearbox two. As the throttle is applied, the clutch is engaged electronically and the car pulls away in first gear. At the appropriate moment drive is switched automatically to the pre-selected second gear and third gear is pre-selected in gearbox one. Gearbox one contains first, third and fifth gears, while gearbox two consists of second, fourth and sixth. Sophisticated electronic control enables gears to be pre-selected according to whether the car is accelerating or decelerating. Pat Oldani, Ford's automatic transmission manager, said: “Our PowerShift transmission is already proving popular on Ford Focus and C-MAX, demonstrating that you can have both excellent fuel economy and low CO2 emissions with an automatic gearbox. The six-speed Ford PowerShift transmission is available with the advanced 136PS 2.0TDCi diesel engine, and the partnership delivers impressive results: in a Ford Focus, the pairing achieves 48.6mpg* and CO2 emissions of 154g/km. Drivers have the option of using a full automatic mode or selecting gears manually. In automatic mode, the enjoyment of relaxed driving is the same as for a conventional automatic transmission, with the usual Park, Reverse, Neutral and Drive settings. 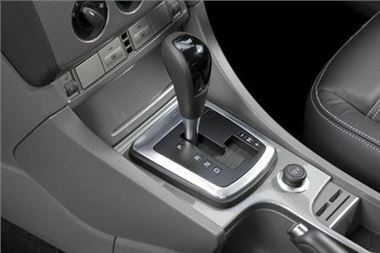 Shifting the gear lever to the right activates a sports mode, enabling the driver to make swift and smooth manual changes when the lever is moved forwards (to change down) or backwards (to change up). The strong torque output of the TDCi diesel engine allows a high sixth gear ratio, leading to relaxed cruising with excellent fuel economy and enhanced refinement.